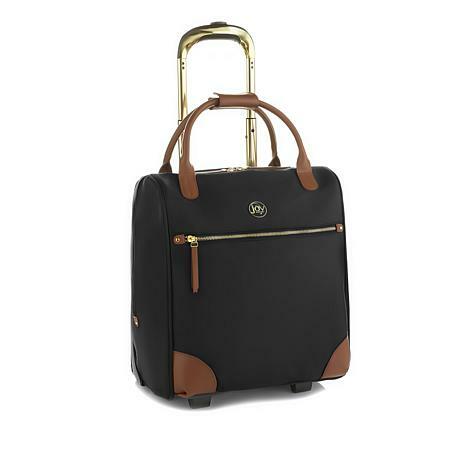 Joy's luxe nylon and leather wheeled pullman meets all of your needs in one fashionable, convenient and sturdy bag. Use as your go-to piece for a quick overnight trip and more. With RFID-blocking technology, you'll feel safe and stylish as you Joyfully travel. My son asked for a new travel bag as he travels on business. He likes it a lot and the color makes it stand out among all the boring old black ones. This was a nice briefcase but that is not what imaged it to be when I ordered it. I returned it. Exchanged first bag, wish I could exchange or return the second one. Lining doesn't fit with the exterior. Recessed handle pushes up through the fabric stretching the zipper which will fail. Wheels are very small and do not get bag off of ground. Thin fabric. Looked pretty on video, and sturdier - it is pretty, but not sturdy. 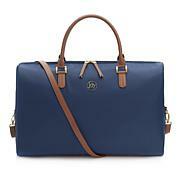 I bought to match the weekender, both of which I got on deal, but even that was not worth the price.